Last month, I shared an outfit post where Essley and I were just, ya know, hanging in the Sonoran desert in unintentionally matching dresses. And I mentioned in that post that these days, the vast majority of the outfit posts I share (which are probably 3-5 a year, if that) are taken on annual Arizona vacations, because the scenery is just so beautiful. So it will come as no surprise that this outfit post was also taken on our trip there in April. I almost didn't share these photos because in all honesty, the dress looks a lot better in person - the golden hour sun sort of washed out the details of the cut and pattern, and it almost resembles a hospital gown in these shots if we're being honest. But in real life I am smitten with the dress, and the background scenery is just to good not to share. So here we are. I wonder if our backyard looked like this if I'd shoot more outfit posts, or if it's just not my thing anymore in general. Regardless, I have a feeing that even if it comes down to only being one of these posts a year, I'll never give up shooting them when we're in the desert. Even when the outfit may be a little lackluster, the landscape makes up for it. 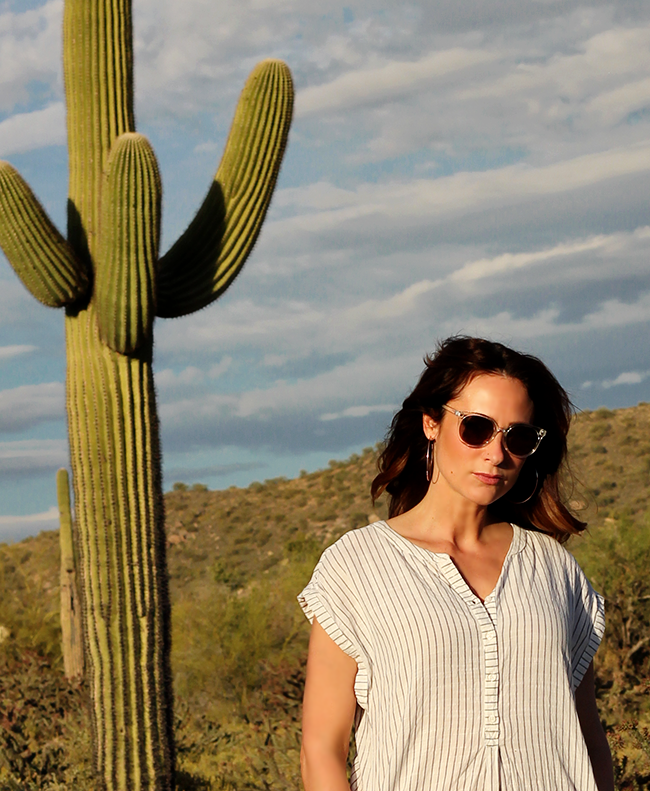 Give me all the cacti and desert sun, man. I always love your outfit-posts, and dresses with pockets. I love dresses with pockets too! You know, that is one of my pet peeves about taking outfit posts. Often, my absolute favourite clothes, the ones that I feel totally comfortable and happy in, are the ones that just look kind of meh on camera. But then I try to remind myself that I'm my own worst critic and it's not likely anyone else is going to look at my photos and think, man, that dress is only okay ;) As far as I'm concerned, you look fabulous here and that background could not be lovelier. Gorgeous scenery and cute dress! I like that it is a little longer in the back! Although we have a large garden it's not really suitable for a backdrop because it's too "busy".